The definition of IoT has evolved over the past four to five years. In the past, the Internet of Things (IoT) was used interchangeably with machine-to-machine (M2M) communications. Over time, the definition has evolved to include technologies such as Big Data analytics, edge computing, cloud-based platforms, and enterprise system integration with people and processes. As IoT solutions increasingly use intelligence and data analytics, and integrate with enterprise management systems, the lines between operational technology (OT) and information technology (IT) are blurring. Frost & Sullivan defines OT as the hardware and software used for sensing and collecting data. This includes all the hardware at the edge of the network. Most IoT solutions involve a combination of OT and IT. The IT in IoT includes the network, cloud-based platforms, data analytics, and integration with other cloud-based applications. A typical IoT solution is deployed at the edge of the network to solve OT challenges. The IT department is typically involved at the end of the development cycle when cloud-based platforms and network connectivity enter the conversation. This typically results in a conflict between the IT and operations departments. The following exhibit depicts a graphical representation of the IoT ecosystem that includes both OT and IT. The CIO’s team is rarely involved with the front-end development of an IoT solution. Its involvement typically starts at the end of the solution development cycle when cloud-based platforms and connectivity management are discussed. The following exhibit highlights the IoT challenges faced by the CIO’s team. IoT is largely an operational solution. However, the use of an organization’s network, cloud capabilities, and integration with other enterprise applications results in the need to involve the IT department during solution development. However, the IT department is generally focused on security, connectivity and management, and often lacks expertise in the operational objectives of deploying the system. This typically results in conflicts between the IT and OT departments. This issue can be resolved by adding personnel with operational expertise in the IT department to educate and manage IoT deployments. IT departments typically use IT solutions to solve organizational challenges. This creates a conflict with operational personnel who are using technology to make business decisions. One area where the conflict is most visible is whether to store data and perform data analysis on the edge or the cloud. Operational personnel are often wary of connecting devices to open networks and look to keep all data in-house, whereas IT personnel are more inclined to centralize storage and analytics capabilities. The IT and OT departments typically view IoT through their distinct lenses. The IT department focuses on the technologies that will be implemented, whereas the OT department focuses on business challenges that can be solved leveraging IoT. This often results in conflicts that can elevate distrust between departments. Organizations have been developing enterprise applications for years, and the layered approach to integration often results in a lack of cohesion and compatibility between distinct systems. This poses a challenge to organizations looking to centralize management and analytics of devices and systems. IT departments must find innovative ways to integrate existing systems with newer deployments to break the silos and create a centralized solution. Alleviating this challenge is essential to realizing the vision of digital transformation and increasing the ROI from IoT deployments. Disruptive innovation creates entirely new markets, often transforming existing markets and displacing established competitors that are slow—or simply refuse—to adopt new ways of doing business. IoT is the catalyst that is driving this digital transformation and has the potential to transform every vertical market and industry by allowing businesses to deconstruct old, inefficient processes and reconstruct processes through technology efficiently and reliably. IoT is inherently about connecting the dots and bridging the gap; whether that means coordinating IT and OT systems, aligning technology and business goals, or streamlining disparate protocols for connecting devices, the goal of IoT is to unify, simplify, and enhance these processes. Vendors and service providers in the IoT ecosystem play a role in creating the building blocks of an overall solution that will help an organization realize its business objectives. However, no one company (no matter how large or small) can develop an end-to-end solution that addresses all business challenges. Participation in a larger ecosystem is essential to success in IoT. In this environment, Telit accelerates the successful integration between operational technologies and solutions with IT infrastructure that helps organizations deploy IoT solutions in a time saving, efficient, and modular fashion. Very rarely does an organization have the ability (or willingness) to “rip and replace” existing/legacy systems when developing their IoT applications. To address this challenge, Telit helps organizations work with the systems they currently have deployed, augments these systems with modular solutions that communicate using off the shelf drivers and connectivity tools, creating a bridge with their enterprise management solutions. Telit helps organizations accelerate their desire to scale deployments from bottom (connecting more “things”) to the top (integration of these “things” with enterprise cloud management solutions). In addition, Telit helps organizations develop intelligent and secure edge computing and control with its edge software and platforms. As an IoT enabler and accelerator, Telit delivers modules to connect devices, provides a diverse range of wireless connectivity services, and offers IoT platforms for managing IoT solutions. Depending on the customer needs, the data collected can be accessed in the Telit cloud based IoT Platform, on-premise servers or simple integration with enterprise clouds such as Amazon Web Services, Microsoft Azure, SAP Leonardo, IBM Watson, and so on. The following exhibit showcases the wide range of products and solutions offered by Telit. Telit creates the bridge to IT systems by enabling communications from its IoT platform into different enterprise systems to help the IT department visualize and manage disparate systems in one horizontal management platform. While IT departments can manage systems that are part of its infrastructure, their lack of expertise in creating business value from edge devices makes Telit the partner of choice for IT and OT decision makers, enabling them to get up and running much faster and avoiding custom integration. IoT has put IT and OT on a collision course due to its role in blurring the lines between both worlds. The lack of OT expertise in the IT department has created challenges for the CIO that cannot be solved with technology, but require a deeper understanding of an organization’s operations and the use of technology to maximize business value. Developing OT expertise in the IT department will create an environment that ensures success of IoT deployments. While this CIO office transformation is a long-term process, organizations that work with IoT providers that understand the importance of bridging the gap between IT and OT will be best positioned for success. The deep portfolio of Telit enables the company to develop a wide range of solutions that help an organization maximize its business value while significantly reducing the time to develop and deploy an IoT solution. Telit has over 20 years of field-proven experience in IoT and Digital Transformation with over 7,000 customers globally that engage with its professional services professionals spanning solution discovery, design, deployment, managed services and more. Telit has gained recognition from industry associations and was recently selected as the “2017 European IIoT Platform for Discrete Applications Customer Value Leadership” Best Practice recipient from Frost & Sullivan. Extracting actionable data from connected devices doesn’t have to be complicated. 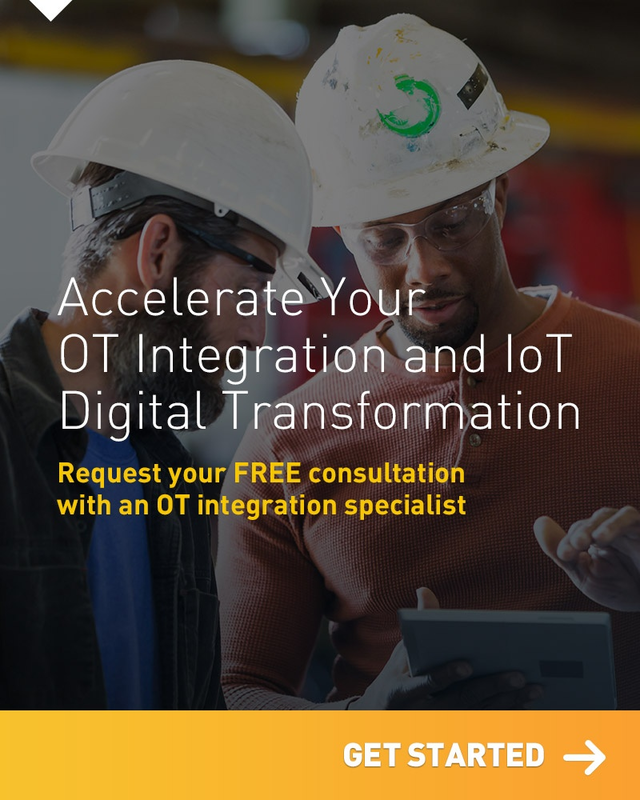 Telit has a team of experienced OT integration specialists ready to get your IoT project up and running in weeks, not months.